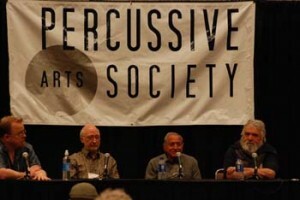 For those of you who did not make it to PASIC 08, or for those who did and could not attend this event on Friday, the world panel discussion: “Early Pioneers of World Music in the Field of Western Percussion” with John Bergamo, Emil Richards, and me can be viewed in a six-part posting on YouTube. The recording quality is quite good, and the discussion touches on our individual recollections about the atmosphere in the North American percussion world during the 1960s and 70s, particularly in relation to the rapid rise in interest and knowledge about musical styles from outside the classical western European tradition. Especially interesting for me were Emil’s thoughts about applications of “exotic” rhythms and orchestrations, and John’s memories of his first contact with, and subsequent immersion in Indian music.